It makes sense - according to an Op4G survey of 2000 American adults, 87% are concerned about their financial future. 35% worry about meeting their regular financial obligations, whether it’s a mortgage payment, a credit card payment etc. 30% (especially men) worry about having enough cash to “maintain a comfortable lifestyle” and 28% worry about an unexpected financial emergency, like a medical issue or car accident. These financial fears are not unfounded. As of 2017, American debt remains disturbingly high. The average US credit card debt, for example, is about $5000 per household, while interest rates hover around 16.75%. Furthermore, the average mortgage debt is nearly $173,000 and the average auto loan exceeds $30,000. At the same time, Americans are ill-equipped to pay off this debt. More than half of Americans (57%) have less than $1000 in their savings accounts – and 39% have no savings at all! So what financial resolutions might we expect for 2018? 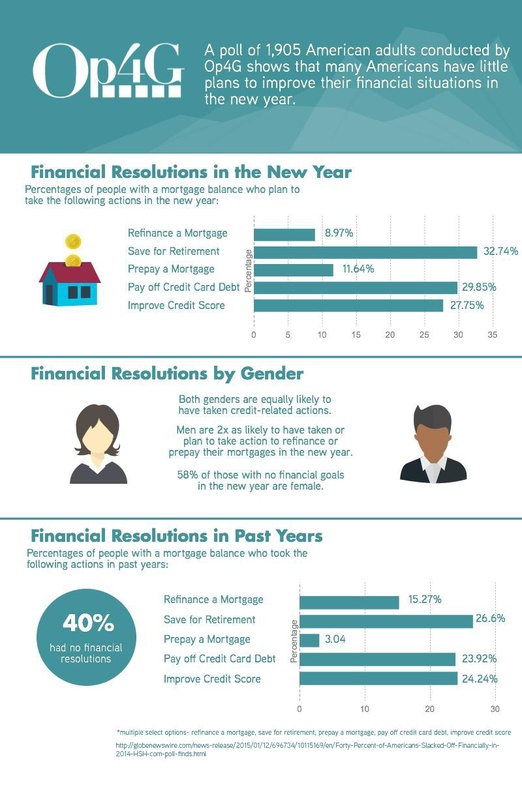 Recently, Op4G polled 1,905 American adults on their financial resolutions for the year ahead. Nearly a third (32.78%) resolved to save for retirement, which costs an average of $738,400). Almost as many 29.85% vowed to pay off their credit card debt. Finally, a minority of respondents said they would tackle their mortgage:11.64% would prepay while 8.97% would refinance. Whatever the resolution, the challenge will be sticking to it (beyond a few months)! An Op4G survey found that in the past, approximately 27% of respondents achieved their resolution to save for retirement and 24% paid off credit card debt, but only 3% successfully prepaid their mortgage. We hope these findings help you with your 2018 New Year's Resolutions. Interested in doing financial research with Op4G? We offer a dedicated team and are sure we can help exceed your research goals this New Year!